When the time comes for businesses to invest in a sales software solution, three letters often pop up: CRM. Perhaps you’ve had a conversation with a business partner, and they say that CRM software is the answer to your needs. Maybe you ventured online and performed a Google search, which returns that well-known acronym, CRM. If you’re a business looking for a sales software solution, more often than not, customer-relationship management finds its way into your field of vision. The name (customer-relationship management) is a slight giveaway. When CRM software is at its best, teams can manage an extensive collection of customers. That includes customer support, keeping details up to date, segmenting your clients, building upsell/cross sale proposals and even email campaigns. All of the above are vital aspects of managing clients. And a CRM helps you improve your customer’s lifetime value. But first, you need customers. While a CRM can help you improve acquisitions; it’s not designed for the sole purpose of doing so. Lead management software, on the other hand, focuses its efforts on the sales process. It aids salespeople so they can turn cold prospects into hard leads, and leads to customers. Equipping salespeople with the right tools is one of the most important parts of selling. Sales managers choose CRM for their team because they think it will give them the best of both worlds. The ability to harness the power of data and have a flexible system that allows reps to track leads. And even managers who understand the pitfalls of CRM often find themselves having to use the software because it’s a global company decision. Unfortunately, CRM tools aren’t designed to offer the best of everything. Instead, they provide multiple facets, rather than a deeply sales-focussed process. But they only work for managers in theory and don’t work for sales reps in practice. Therein lies the problem, as salespeople don’t care about marketing automation, customer support or data entry. They want to convert. And they need a software that helps them do it with minimal fuss. In the mind of a salesperson, a CRM is nothing more than an obstacle blocking their path to converting deals. But let’s look at why salespeople have come to such a conclusion, which starts with understanding their mindset. A CRM tool asks for several data points of information before moving onto the next step. From entering the full name of a person to asking for in-depth company details, the info is extensive. All this does is slow the rep down on a lead that may never materialize. Salespeople gamify the sales process; it’s part of their nature and feeds into a competitive way of thinking. Asking them to enter cumbersome data into complicated software is like getting a pilot to do the flight safety demonstration before it takes off. CRM systems are good at managing contact data but salespeople aren’t designed to fill them in, which is ultimately counterproductive. If a salesperson is hesitant to fill in copious amounts of data, neither the rep or the manager will derive maximum use from the system. You end up with a multi-functioning tool working at 25% of its capacity. Nobody wins. Even when salespeople do take time to fill out a CRM, they do so with little enthusiasm. They see them as reporting tools for management, rather than something that makes them a better seller. Reps will fill them out minutes before meetings start, which is unhelpful to managers. A manager is hoping to analyze the data and garner clear insights. Yet a rep is just looking to complete a task they never wanted to do in the first place. This leads to the entering of poor information, which results in sales managers having useless data. The best lead management software helps you manage leads. That means it helps you turn a prospect into a customer. The idea is to organize the sales process effectively, to have a clear image of all the open sales opportunities, to easily track each lead and see all the interactions you had with your prospect: the emails you sent them, the calls, the quotes and proposals. You can define your pipeline based on the way you sell your product or service with lead management software. In general lead management software is easier to setup and customize than CRM. The result means you can bypass needing to have a technical whizz in your team for when problems arise as they are minimal. Think of lead management software as a pre-CRM. You give your salespeople a tool to manage all their prospects, and when they convert them into customers, you then add the customer to your CRM. If you are in the process of choosing a tool, the first question is “what do you need now?”. 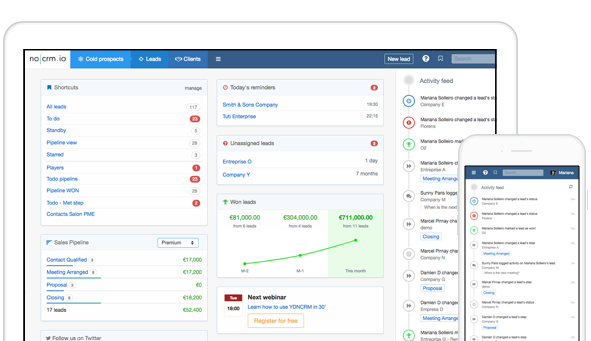 Is it something to manage your existing customers (go for a CRM) or a tool to help your sales people (go for a lead management software). Salespeople need a tool that is principally aimed at them. Something to fit into their daily routine with minimal fuss. Managers need to track where their teams’ leads are in the pipeline at all times. That way they can step in if needed and make informed decisions at any time during the process. So, if you’re looking to make a clear distinction between lead management software and CRM, think of it like this: CRM software is designed to look after the whole process. They require a philosophy based on the customer that is inclusive of support, service, marketing and sales. Lead management software is action-oriented, always providing the salesperson with a next step. It cuts through the noise and concentrates on converting leads. A CRM is more of a tool for your company process. It will help your admin team, might help your CEO and your marketing team, but doesn’t utilise salespeople’s key assets — their ability to sell. Lead management software, however, helps your sales department. It’s aim is to grow your business. Once your company has reached a certain size, you will need a CRM. At that point the best solution is to connect your lead management software to your CRM.